Andrew Lloyd Webber's The Phantom of the Opera makes history on January 26, officially celebrating 30 years at the Majestic Theatre. The hit musical has been dazzling Broadway crowds since opening in 1988 with Michael Crawford and Sarah Brightman in the leading roles. The Phantom of the Opera marked this week's occasion with a number of special events, including a star-studded red carpet leading up to a special anniversary show featuring the attendance of Phantom creatives and alumni cast as well as a special post-show onstage presentation with musical numbers by surprise guest artists. The current cast of Broadway's longest-running musical is led by Peter Jöback in the title role alongside Broadway.com vlogger Ali Ewoldt as Christine and Aladdin alum Rodney Ingram as Raoul. 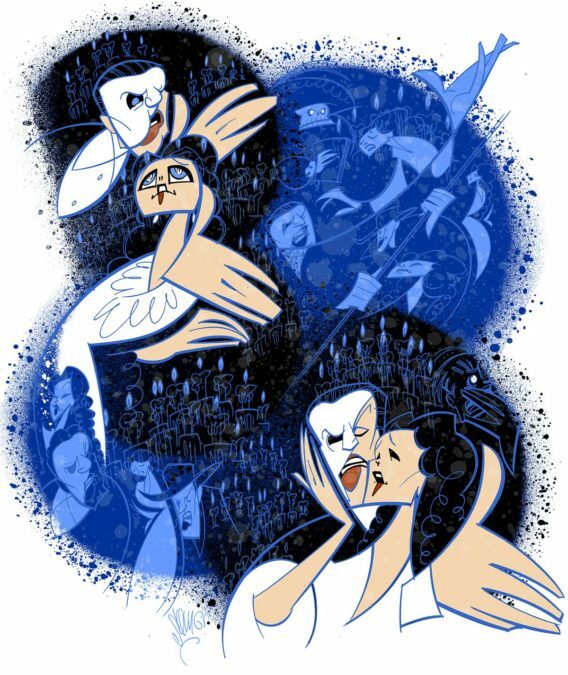 To celebrate the hit musical's milestone, Broadway.com Resident Artist Justin "Squigs" Robertson sketched a portrait of Jöback and Ewoldt as well as originals Crawford and Brightman, with a glorious nod to Phantom's many stars over its 30 years on the Great White Way.